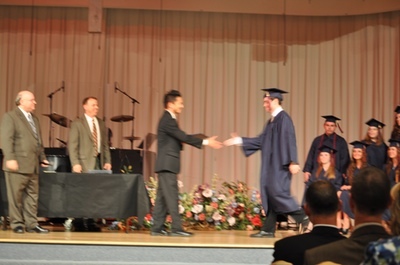 In the above photo I’m presenting my step-son with his diploma. Having a kid go off to college gives you some perspective on raising them because a lot of things you thought were super important at the time don’t really matter in the long run. In raising kids, the first thing you need to understand is that your kids are sinners, just like you, who will leave the house one day and independently make spiritual choices. And since humans are slow learners, you don’t do this in a couple conversations. It takes years. You have to build a spiritual foundation for them, brick by brick, day by day. So that when they leave your care, they have built their life using your spiritual foundation. Either you train them, or the world will. Which brings us to the big point… If you are to train your child spiritually – you have to be trained yourself. You can’t teach what you don’t understand. If you are trying to teach your kid patience – have you learned how to be patient with others, at stoplights, at the grocery store? Or are you teaching them by your actions how be impatient? If you are trying to teach self-control – have you figured out how to hold your tongue, watch your diet and exercise? Or are you by your actions teaching them a lack of self control? If you are trying to teach faith in God – do you fall apart in front of them when something bad happens? Or do you teach them by how you act? You can’t teach what you don’t know. This is not to say that you must be perfect – let’s face it, you’re not Oprah. But in your shortcomings you can still show your understanding. Because our spiritual life is about growth, we should never set ourselves up to our kids as perfect – because we’re not. But we can show them that we not only are sinners like them, but show them that we’re trying to grow. You show them how you try to deal with your own sin – so that they can learn how to deal with theirs. Let them know what fruit of the spirit you are lacking, or what verses you failed to implement. Let them hear how you pray to overcome your sins, how you pray for growth. Have your kids pray for you. If your faith is shaken by trials like losing a job, or financial problems, you tell your kids what you’re going through, and that you need prayer for faith to live out a verse like Romans 8:28. 1. You need faith to deal with problems. 2. Humility by sharing your faults. 3. You need other people praying for you. You need to live scripture. You teach by example. You have sin. So use your example of how you try to overcome your sin to teach your kids how to overcome their sin. And maybe, just maybe, one day, through all of this, they will finally stop stealing your food out of the fridge. James 2:13 Who is wise and understanding among you? Let them show it by their good life, by deeds done in the humility that comes from wisdom. Take time to pray: Ask for the wisdom and humility to be open with your kids about your sin so that you might be able to teach them how to deal with theirs.